نیک صفت, مرضیه, آیتی, بیتا. (1394). تعیین شرایط بهینه حذف اسید قرمز 14 توسط نانوذرات آهن اصلاح شده با نیکل در سیستم دوغابی. مجله آب و فاضلاب, 27(1), 29-39. مرضیه نیک صفت; بیتا آیتی. "تعیین شرایط بهینه حذف اسید قرمز 14 توسط نانوذرات آهن اصلاح شده با نیکل در سیستم دوغابی". مجله آب و فاضلاب, 27, 1, 1394, 29-39. نیک صفت, مرضیه, آیتی, بیتا. (1394). 'تعیین شرایط بهینه حذف اسید قرمز 14 توسط نانوذرات آهن اصلاح شده با نیکل در سیستم دوغابی', مجله آب و فاضلاب, 27(1), pp. 29-39. نیک صفت, مرضیه, آیتی, بیتا. تعیین شرایط بهینه حذف اسید قرمز 14 توسط نانوذرات آهن اصلاح شده با نیکل در سیستم دوغابی. مجله آب و فاضلاب, 1394; 27(1): 29-39. در این پژوهش، برای حذف رنگزای اسید قرمز 14 در سیستم دوغابی از نانوذرات دو فلزی آهن- نیکل استفاده شد که ساخت آن از روش رسوب‌دهی شیمیایی کلرید آهن توسط عامل احیا کننده قوی سدیم بورهیدرید بود. پارامترهای غلظت اولیه رنگزا، دز نانوذرات، pH، مدت زمان طی شده از ساخت تا استفاده نانوذرات، سرعت همزن و دما برای رسیدن به شرایط بهینه بررسی شد. سپس برای شناسایی سایر عوامل مؤثر، آزمایش‌های شاهد، در شرایط بهینه انجام شد. شرایط بهینه در دمای 2±25 درجه سلسیوس در غلظت نانوذرات تازه برابر 05/0 گرم در لیتر، غلظت اولیه رنگزا 200 میلی‌گرم در لیتر، pH برابر5/7 و دو دقیقه هم‌زدن به‌دست آمد. طبق نتایج حاصل، این نانوذرات فعالیت بسیار بالایی داشتند به‌طوری که راندمان حذف رنگزا در شرایط بهینه پس از 2، 30 و 240 دقیقه به‌ترتیب 39/79 ،52/90 و 42/94 درصد و همچنین راندمان حذف COD بعد از گذشت 4 ساعت از شروع واکنش برابر 61/72 درصد به‌دست آمد. In this study, bimetallic iron–nickel nanoparticles were obtained by chemical co-deposition of iron chloride with sodium boron hydride used as a strong reducing agent. The bimetallic nanoparticles thus obtained were then used to remove acid red 14 in a slurry system. Experiments were conducted to investigate such parameters as initial dye concentration, nano-particle dosage, pH, the time required for the nano-particles to be used after they are formed, the stirring speed, and the temperature required to reach optimum reaction conditions. Control experiments were subsequently performed under the optimum conditions thus determined to identify any other remaining factors involved. The optimum conditions included a temperature of 25±2 ºC, a newly synthesized nano-particle concentration of 0.05 g/L, an initial dye concentration of 200 mg/L, a pH level of 7.5, and a mixing duration of two minutes. The results indicated the high activity of the nanoparticles such that removal efficiencies equal to 79.39, 90.52, and 94.42 percent were achieved after 2, 30, and 240 minutes, respectively. Moreover, a COD removal of 72.61 percent was achieved after 4 hours of reaction. 1. Chequer, F. M. D., de Oliveira, G. A. R., Ferraz, E. R. A., Cardoso, J. C., Zanoni, M. V. B., and de Oliveira, D. P. (2013). “Textile dyes: Dyeing process and environmental impact.” Eco-Friendly Textile Dyeing and Finishing, 6, 151-176. 3. Somasiri, W., Li, X.F., Ruan, W.Q., and Jain C. (2008). “Evaluation of the efficacy of upflow anaerobic sludge blanket reactor in removal of colour and reduction of COD in real textile wastewater.” Bioresource Technology, 99, 3692-3699. 4. 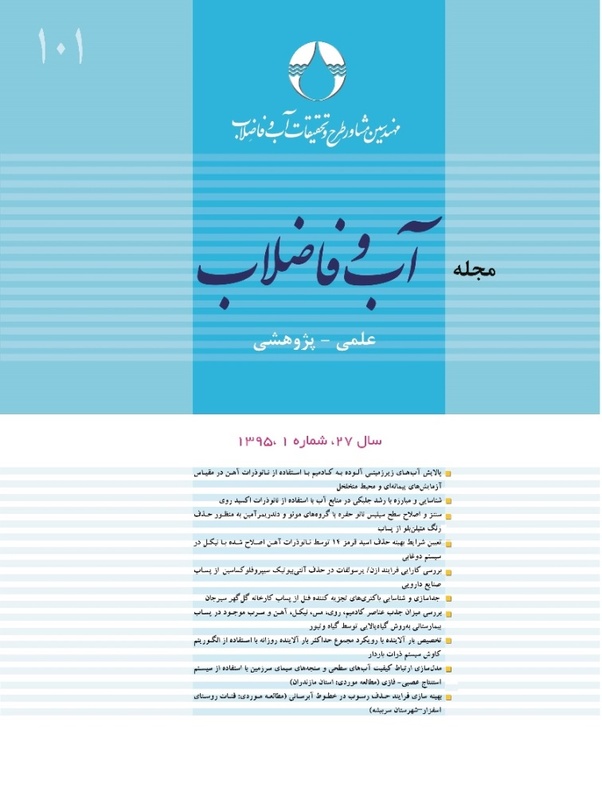 Daneshvar, N., Aber, S., Vatanpour, V., and Rasoulifard, M. H. (2008). “Electro-fenton treatment of dyesolution containing orange II, influence of operational parameters.” Electroanalytical Chemistry, 615, 165-174. 5. Abo-Farha, S.A. (2010). “Comparative study of oxidation of some azo dyes by different advanced oxidation processes: Fenton, fenton-like, photo-fenton and photo-fenton-like.” Journal of American Science, 6 (10), 128-142. 6. Khataee, A.R., Vatanpour V., and Amani Ghadim, A. R. (2009). “Decolorization of C.I. acid blue 9 solution by UV/Nano-TiO2, fenton, fenton-like, electro-fenton and electrocoagulation processes: A comparative study.” Journal of Hazardous Materials, 161, 1225-1233. 7. Riera-Torres, M., Gutiérrez-Bouzán, C., and Crespi, M. (2010). “Combination of coagulation–flocculation and nanofiltration techniques for dye removal and water reuse in textile effluents.” Desalination, 252, 53-59. 8. Zille, A. (2005). “Degradation of dyes with microorgsnisms studies with ascomycete yeasts.” University of Minho, Braga, Portugal. 10. Boparai, H.K., Joseph, M., and O’Carroll, D.M. (2011). “Kinetics and thermodynamics of cadmium ion removal by adsorption onto nanozerovalent iron particles.” Hazard. Mater., 186, 458-465. 11. Hwang, Y.H., Kim, D.G., and Shin, H.S. (2011). “Mechanism study of nitrate reduction by nano zero valent iron.” Hazard. Mater., 185, 1513-1521. 12. O’Carroll, D., Sleep, B., Krol, M., Boparai, H., and Kocur, Ch. (2013). “Nanoscale zero valent iron and bimetallic particles for contaminated site remediation.” Advances in Water Resources, 51, 104-122. 13. Shang Hee, J., and Francis Cheng, I. (2006). Nanotechnology for environmental remediation, Springer Pub. 14. Xu, Y., and Zhang, W.X. (2000). “Subcolloidal Fe/Ag particles for reductive dehalogenation of chlorinated benzenes.” Industrial and Engineering Chemistry Research, 39, 2238-2244. 15. Gillham, R. W., and O’Hannesin, S.F. (1994). “Enhanced degradation of halogenated aliphatics by zero valent iron.” Ground Water, 32, 958-967. 16. Barnes, R.J., Riba, O., Gardner, M.N., Scott, T.B., Jackman, S.A., and Thompson, I.P. (2010). “Optimization of nano-scale nickel/iron particles for the reduction of high concentration chlorinated aliphatic hydrocarbon solutions.” Chemosphere, 79, 448-454. 17. Bokare, A.D., Chikate, R.C., Rode, C.V., and Paknikar, K.M. (2008). “Iron-nickel bimetallic nanoparticles for reductive degradation of azo dye Orange G in aqueous solution.” Applied Catalysis B: Environmental, 79, 270-278. 18. Schrick, B., Blough, J.L., Jones, A.D., and Mallouk T.E. (2002). “Hydrodechlorination of trichloroethylene to hydrocarbons using bimetallic nickel–iron nanoparticles.” Chem. Mater., 14, 5140-5147. 19. Tosco, T., Papini, M. P., Viggi, C. C., and Sethi, R. (2014). “Nanoscale zerovalent iron particles for groundwater remediation: A review.” J. of Cleaner Production, 77, 10-21. 21. Xinwen Liu, Chen Zhengxian, Chen Zuliang, Megharaj llavarapu, and Naidu Ravendra. (2013). “Remediation of direct black G in wastewater using kaolin-supported bimetallic Fe/Ni nanoparticles.” Chemical Engineering Journal, 223, 764-771. 22. Weng, X., Chen, Z., Chen, Z., Megharaj, M., and Naidu, R. (2014). “Clay supported bimetallic Fe/Ni nanoparticles used for reductive degradation of amoxicillin in aqueous solution: Characterization and kinetics.” Colloids and Surfaces A: Physicochemical and Engineering Aspects, 443, 404-409. 23. APHA, WEF. (2005). Standard methods for the examination of water and wastewater, 21th Edition, Washington D.C., USA. 25. Lee, C., Jee, Y.K., Won, I.L., Nelson, K.L., Yoon, J., and Sedlak, D.L. (2008). “Bactericidal effect of zerovalent iron nanoparticles on Escherichia coli.” Environmental Science and Technology, 42 , 4927-4933. 26. Lien, H.L., and Zhang, W.X. (2007). “Nanoscale Pd/Fe bimetallic particles: Catalytic effect of palladium on hydrodechlorination.” Environmental, 77, 110-116. 28. Chompuchan, C., Satapanajaru T., Suntornchot, P., and Pengthamkeerati P. (2010). “Decolorization of reactive black 5 and reactive red 198 using nanoscale zerovalent iron.” International Journal of Civil and Environmental Engineering, 2, 3-8. 29. Satapanajaru, T., Anurakpongsatorn, P., Pengthamkeerati, P., and Boparai, H. (2008). “Remediation of atrazine-contaminated soil and water by nano zerovalent iron.” Water Air Soil Poll., 192, 349-359. 30. Zhu, N.R., Luan, H.W., Yuan, S.H., Chen, J.,Wu, X.H., and Wang L.L. (2010). “Effective dechlorination of HCB by nanoscale Cu/Fe particles.” J. Hazard. Mater., 176, 1101-1105. 31. Song, H., and Carraway, E.R. (2006). “Reduction of chlorinated methanes by nano-sized zero-valent iron. Kinetics, pathways, and effect of reaction conditions.” Environmental Engineering, 23, 272-284. 32. Yan, W., Herzing, A.A., Li, X.Q., Kiely, C.J., and Zhang, W.X. (2010). “Structural evolution of Pd-doped nanoscale zero-valent iron (nZVI) in aqueous media and implications for particle aging and reactivity.” Environ. Sci. Technol., 44, 4288-4294. 33. Sarathy, V., Tratnyek, P.G., Nurmi, J.T., Baer, D.R., Amonette, J.E., and Chun, C.L. (2008). “Aging of iron nanoparticles in aqueous solution: Effects on structure and reactivity.” Physical Chemistry, 112, 2286-2293. 34. Liu, Y., and Lowry, G.V. (2006). “Effect of particle age (Fe0 content) and solution pH on NZVI reactivity: H2 evolution and TCE dechlorination.” Environmental Science and Technology, 40, 6085-6090. 36. Shih, Y. H., Tso, C. P., and Tung, L. Y. (2010). “Rapid degradation of methyl orange with nanoscale zerovalent iron particles.” Nanotechnology, 7, 16-17. 37. Bansal, P., Singh, D., and Sud, D. (2010). “Photocatalytic degradation of azo dye in aqueous TiO2 suspension: Reaction pathway and identiﬁcation of intermediates products by LC/MS.” Separation and Puriﬁcation Technology, 72, 357-365.